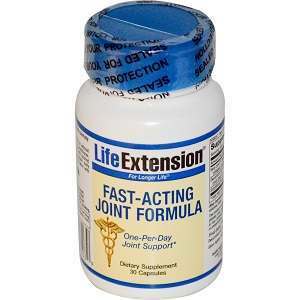 Life Extension Fast-Acting Joint Formula contains three compounds that the product vendor claims improve joint comfort and ease of motion quickly compared to other supplements like glucosamine. Hyal-Joint™: this is a blend of hyaluronic acid, collagen, and other glycosaminoglycans that work to lubricate joints by increasing viscosity of the synovial fluid that cushions joint cartilage. Taking this product once a day provides fast acting joint support according to the product source. Other ingrediants – gelatin, microcrystalline cellulose, vegetable stearate, silica (no amount in milligrams provided). Take two capsules if needed until desired effect is obtained, then take one capsule daily. May provide added benefit when taken with joint support formulas. Life Extension offers a two tier price structure depending on whether a customer is a Life Extension member or not. Each product container contains 30 capsules or a 1 month supply. Nothing is said in the product source about product guarantees or return policies. The product source does contain toll free contact numbers for orders, advice and help that should be able to provide information about guarantees and returns. Product reviews provided in the product source were good. The product is expensive but for a customer willing to become a Life Extension member probable worth a try after initially contacting one of the contact numbers provided in the product source to find out about product returns and guarantees offered. Mark Stevens	reviewed Life Extension	on June 25th	 and gave it a rating of 2.